Lugano, Switzerland- 21 August 2018 – A new scale for tumour DNA mutations which will simplify and standardise choices for targeted cancer treatment has been agreed by leading cancer specialists in Europe and North America. The scale, called ESCAT (ESMO Scale for Clinical Actionability of molecular Targets), is published this week in the Annals of Oncology (1). It aims to optimise patient care by making it easier to identify patients with cancer who are likely to respond to precision medicines, and help make treatment more cost effective. "Doctors receive a growing amount of information about the genetic make-up of each patient's cancer, but this can be difficult to interpret for making optimal treatment choices," explains Professor Fabrice André, Chair of the ESMO Translational Research and Precision Medicine Working Group (2) who initiated this project. "The new scale will help us distinguish between alterations in tumour DNA that are important for decisions about targeted medicines or access to clinical trials, and those which aren't relevant." The new grading system classes alterations in tumour DNA according to their relevance as markers for selecting patients for targeted treatment, based on the strength of clinical evidence supporting them (Tier I-V, Table 1). It is the first time that a classification has been developed that is relevant to all potential targeted cancer medicines, not just those that have been approved for use by national regulatory bodies. The classification also enables mutations to be upgraded or downgraded in response to newly available data. "For the first time, ESMO has created the tools to make it clear what data are needed for a mutation to be considered actionable and how this may change in response to new clinical data," says Dr Joaquin Mateo, lead author of the paper, Principal Investigator of the Prostate Cancer Translational Research Group from the Vall d'Hebron Institute of Oncology, Barcelona, Spain. "The scale focuses on the clinical evidence for matching tumour mutations with the drugs we have in our clinics and gives us a common vocabulary for communication between clinicians, and for explaining potential treatment benefits to patients," he continues. As ESMO disseminates ESCAT into clinical practice, it is hoped that cancer centres and laboratories will start to routinely include Tier I-V grading of genomic mutations in patients' clinical and laboratory reports and discuss results at tumour boards and clinics. "If one mutation is Tier I and another is Tier III, it is important that everyone understands the need to prioritise the Tier I mutation in determining the patient's treatment and implementing precision medicine," Mateo points out. ESCAT will also make it easier for clinicians and patients to discuss the results of multigene sequencing. More and more patients are offered a multigene sequencing nowadays. 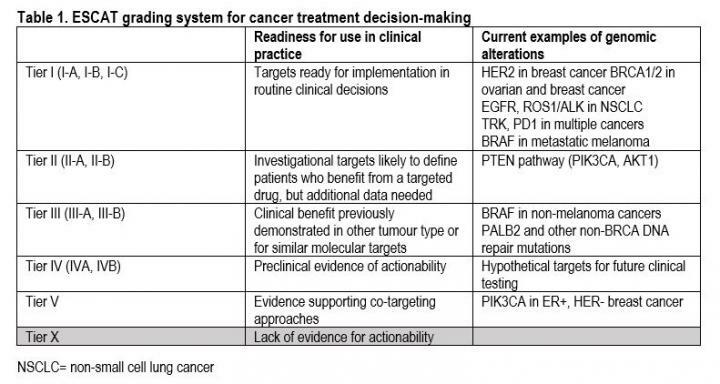 Current testing techniques frequently show that many of the genes in a patient's tumour are mutated but it is unclear which are relevant to treatment decisions. By using the scale to show which alterations are relevant, it becomes easier to identify and agree the right treatment for the right patient. "ESCAT will bring order to the current jungle of mutation analysis so that we all speak the same language for classifying mutations and prioritising how we use them to enhance patient care," concludes André.